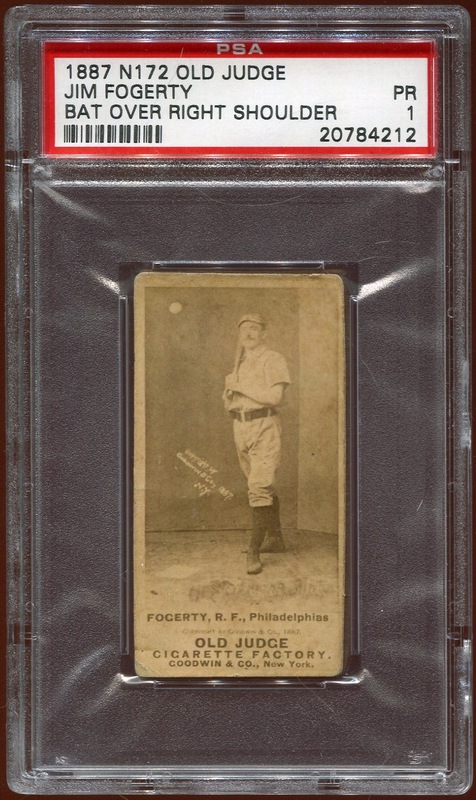 After more years than I care to count, I finally own my first 19th-century Phillies baseball card. I actually got very lucky here; I had been watching this card on eBay for some time, and over the past couple months, as the card cycled through one “Buy It Now” auction after another with no takers, the price kept slowly dropping until it hit a point where it became impossible for me to continue to sit idly by (the price had dropped to more than $30 below what I thought was a fair price). However, it was still more money than I had at my disposal, so a few other parts of my non-Phillies collection will have to go onto eBay so that I can pay the credit card bill when it comes. Chances are pretty good that this will be the only 19th-century card I will ever own; I’ve actually said, with total honesty, to my wife on a number of occasions that I only needed just one card from that era to make me happy, and I do not imagine that will change. However, I will never say never — if for no other reason than I’ve previously acquired cards I never thought I would own. Regardless, it’s incredibly satisfying to fill this particular hole in my collection.